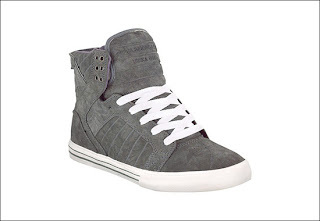 I am a big fan of what Supra Footwear had done to elevate the shoe game with the Skytop, Vaidar and the Soprano. The subsidiary of KR3W has had a lot of success as of late with the Skytop. To date the shoe has undergone a variety of colorways from insane fluorescents and all over patterns to unique contrasting two-tones, which is great but at the end of the day its not a "go to" everyday shoe. In my opinion that just changed with the release of this toned down version. The grey on grey Skytop is available at CCS.com. Also Sneaker Freaker did a rad interview with Angel Cabada founder of KR3W and Supra Footwear.